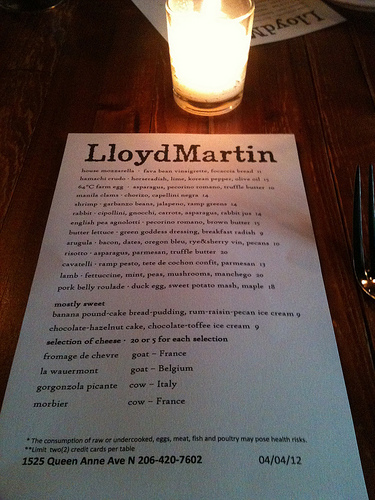 Tonight I joined some friends for dinner at LloydMartin on Queen Anne. This was my first visit to LloydMartin. The restaurant opened its doors back in October. It's a great little place. There is a full bar to one side of the restaurant that is adjacent to the tiny, open kitchen in the back corner. The opposite wall has windows with a view into the wine room. I love a restaurant that prints up small menus daily. LloydMartin offers a few new items each day. It's nice when the menu changes up quite a bit. We started our meal with the house mozzarella, fava bean vinaigrette and focaccia bread. This was very tasty! I love good bread, and this was good bread. 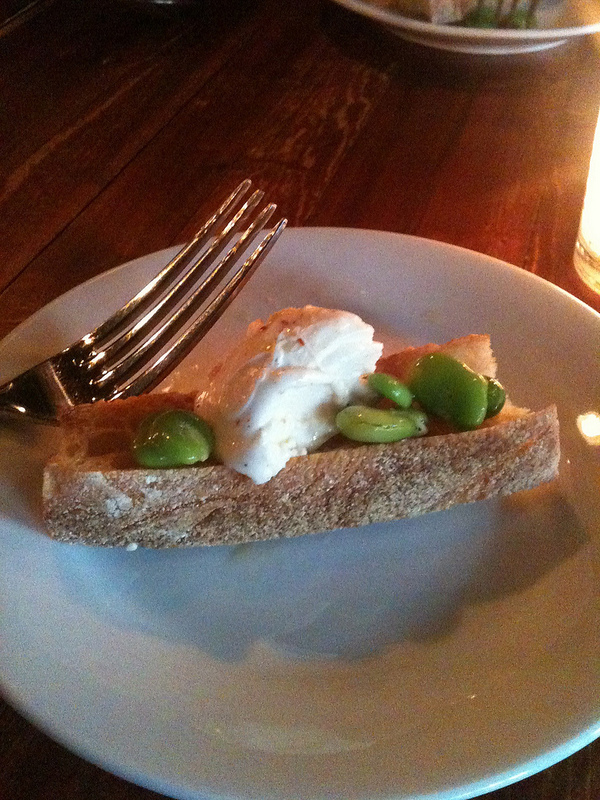 The fava beans with vinaigrette were delicious, and the house mozzarella was the perfect consistency. All three make a great combination. 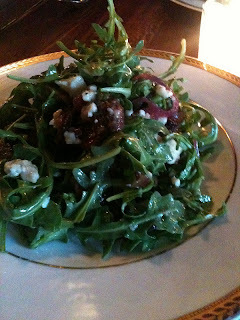 Next I went with the arugula salad. I can honestly say this was one of the best salads I have had in a long time. It had a generous portion of cut up warm bacon, dates, Oregon bleu cheese, rye & sherry vinaigrette, and toasted pecans. I could have easily eaten this as my main course. So delicious. My main course was the rabbit. I haven't had much rabbit in my life, but if it's this good, I will definitely eat more of it! This was prepared almost like a hearty soup or stew. The rabbit was accompanied by cipollini (onion), gnocchi, carrots, asparagus and rabbit jus. 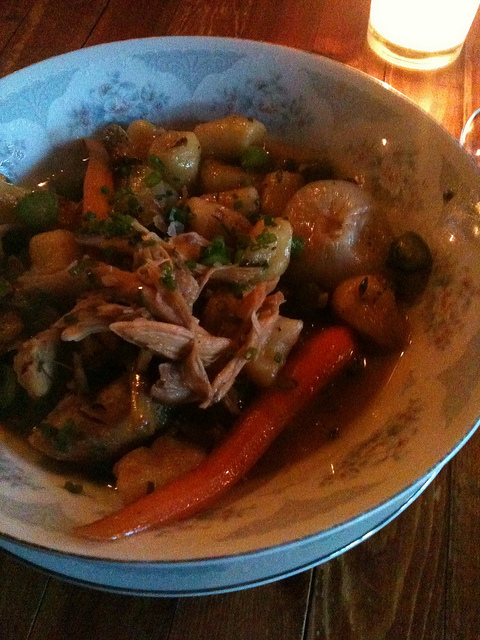 The rabbit jus was so flavorful I wanted to lift up the bowl and drink it! This meal would be perfect on a rainy autumn day, Hell, it's good anyday! 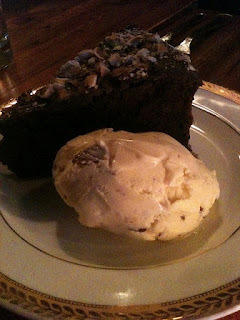 For dessert, we ordered the chocolate-hazelnut cake with chocolate-toffee ice cream. Both, of course, were so good. The cake wasn't too heavy or rich. The top of the cake had a chocolate shell coating sprinkled with hazelnuts. The ice cream wasn't as chocolately as I was expecting, but it was still very good with small bits of toffee throughout. I will definitely make a return visit to LloydMartin. Every item on the menu sounded very tasty. Our server mentioned to us that all the pasta is made fresh daily. I can't wait to come back to try some of the other deliciousness LloydMartin has to offer.